So I have got a definite YES out of the CFO....I have a green light for a new 2014 23 LSV!!! I took a trip to my dealer today and went over the options for the boat as well as colors. Tomorrow I'm heading back to finalize everything. 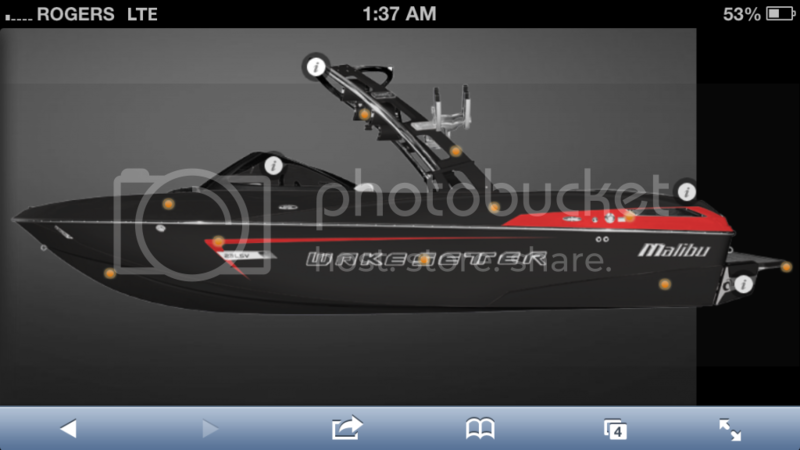 The dealer has a 23LSV on order that he is changing and will be my boat. It apparently builds and ships in June, but he doesn't have a finalized spray date. Hopefully he will get one for me. Can anyone think of anything that I may have missed that I will really want?? 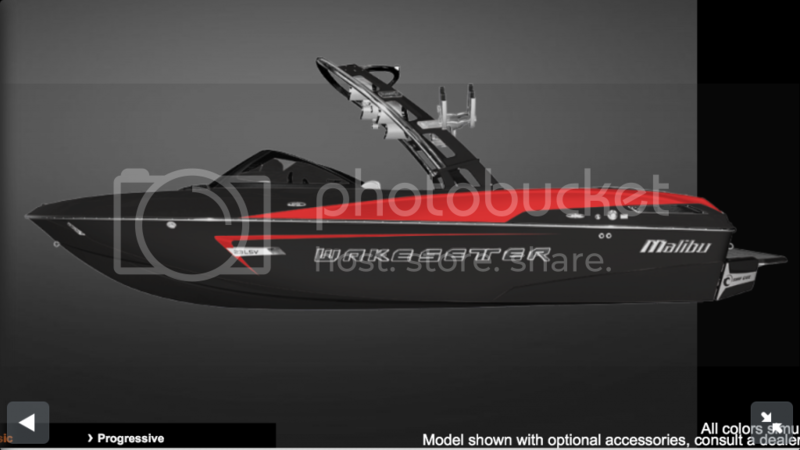 My wife has said I can order the boat of my dreams, so it's now or never!! I am really wondering about the bimini. Should I go with the CS slider or go with the GL? I read the thread on them and it didn't seem conclusive either way. My dealer is an Evolution cover dealer so I have deleted the CS cover from Malibu and am going to get an Evo cover instead. From everything that everyone has said and I have read, that is the way to go. OR this....I am torn...and I have to decide by tomorrow morning. I like the top one, and congrats that is going to be a beautiful boat!!! #2, It just breaks it up a little more! That is a lot of black. She should look great on the water. Congrats. Thanks, it should look pretty nice. Which bimini should I go with?? Do you need to fold the tower to store the boat? If you fold to get it in you do not want the slider bimini then. It has to be removed as it ends up being the high point. Your two color schemes are similar to two that I considered (only difference is I have silver flake Hull Main). I went with #1 because I wanted red as an accent, not a main color. So it really depends on how prominent you want red on your boat. I went with the GL bimini because 1) I like the thicker Subrella material better, and 2) I don't have to remove the entire deal to get into my garage. I had the GL on my VLX and I loved it. But I will admit, the CS Slider bimini is both cheaper and easier to deploy. If I didn't have to lower the tower ever, I'd probably have gone with the CS Slider. My garage door opening is 9' tall....if I got the slider, will it go down far enough to clear the 9' opening? That is a good question. Depending on tires and rims etc, you may be fine. The slider seems pretty slick. I like the 2nd color scheme better. I'm assuming dual axle trailer. Do you need a swing tongue on the trailer? Board racks in the pics it looks like 2 pair? Flush Pro is also nice. #2: Tower speakers. IMO, order the minimum (or no) stereo and go all aftermarket. You will get a far better bang for your buck, even if you are having a pro do the install. A modest Exile or Wetsounds setup will sound far better than the Rockford setup for the same money. Does your wife have a sister? Hotter or uglier, it wouldn't matter. Congrats on the new bu, can't go wrong with either but I prefer #2. For the tower speakers. If u do go with the factory option be sure to upgrade to the wetsound horns. I have them on my TXi. They sound amazing. The std speakers are crap ... Not even RF ... Cheap mb quartz I think. My .05 ... Btw, congrats! I like option #2 but both look great. Congrats!!!! They both look great, but I'm all for option 1. Congrats! Thanks guys. I'm pretty excited. Can anyone offer advice in the Bimini? I thought the underwater lights were pretty tough to install after the boat was built? Both look good...marginal preference for #1. While I haven't had either, I was under the impression that tower lights were much more functional than the docking lights. Not at all. FMAN did it on his new VLX and said the pigtail for the wiring was already there. Splice into the wiring, activate the option in the Maliview and you are done. Requires a bit of drilling and some sealant, but that's not a big deal.